How's that for a graphic, mofos? Here is an actual photo of my bedroom closet. 1) What percentage of this clothing have I actually worn in the last two years? 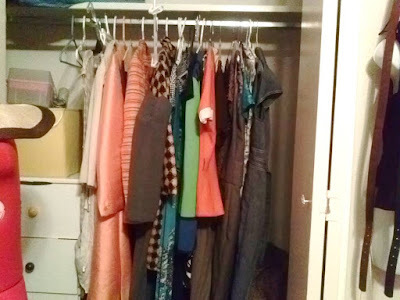 2) What is in the dresser in the left portion of the closet? 3) What is my favorite color? Answer in the comments. Most correct answerererer gets a Chuck's Principles for Life bookmark and a random item from my garage. 2) If it's anything like my dresser, it's undergarments, jeans, t-shirts, and at least one junk drawer. But it's usually two junk drawers. 3) Peach, or some version of it. Maybe pink. I'm kind of going blind, so I may not be seeing that correctly. I like this contest. Even if I get them all wrong, I didn't have to think. I like not thinking. 1) Last 2 years? Zilch. You've worn none of them. 2) Empty plastic bags and random batteries that may or may not still work properly. 3 ) Green. And not that silly light yellow-green. It's a good dark hunter green. 1) Maybe 10%? There are a couple of things in there that could be real vintage gems. 2) Wrapping paper/gift bags, crafty things, and other miscellaneous catch-all stuff. 3) Blue. Royal, or maybe navy. I'm going with this being your vintage/sewing projects closet, so you've worn less than 5% of it this past year. The drawers are full of patterns and fabric. Your favorite color is teal. 1. 50%. You've worn that much because you didn't have anything else. 2. Socks. And clothes you won't wear even when you don't have anything else. And a manuscript of your magnum opus which, like the majority of Emily Dickinson's poems, will only reveal to the world what a genius you were after you're gone.